Cart Lifts provide additional vertical travel distance in small footprint areas over typical scissor lifts. They also reduce time lost to personnel injuries and help increase productivity. 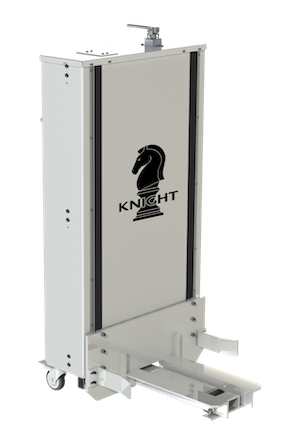 Knight Hydraulic Cart Lifts can be designed to fit a multitude of application and come equipped with hydraulic steel fittings. Polished chrome shafts are used at all slide and pivot points to minimize the wear and prolong component life. We also offer optional stainless steel braided hydraulic hosing for increased durability. All carts are inspected and tested before they leave our facility. 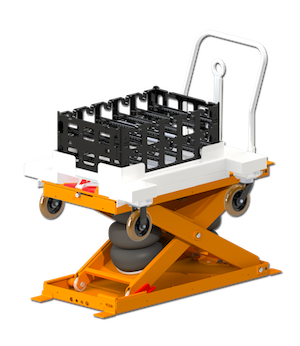 Fork-free lift that raises carts to the operators working level for a safe and efficient workplace. Equipped with hydraulic steel fittings and stainless steel braided hydraulic hosing for increased durability are optional. Length of Travel: Up to 31 in. [58mm]. Front or Side Load Configurations.